More about the previously unknown fourth branch of the US government revealed. Click on image to enlarge, or click here for the original. 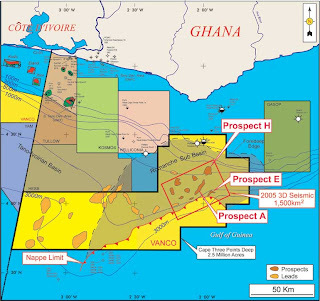 This map was published in 2002 by Vanco after signing the Cape Three Points Deep Petroleum Agreement with Ghana. They consider the geology of the deep water areas off the Ghanaian coast well situated for potential oil reserves. The first well was projected for 2007. And as we have just heard in recent days, there is a major oil discovery off the western coast of Ghana. From the looks of this map, there might be more discoveries on the way. Ghana will need strength and foresight to deal with this, so that the oil may have a chance to help rather than harm the people of Ghana. I am praying Ghana may escape the oil curse. Can oil revenues be made to work for Africans or will they profit only the corrupt few? Are oil revenues destined to fuel civil wars and pay for the abuse of human rights or can they build peace and prosperity? Can African oil and gas reserves be exploited without harming the environment, or is the expansion of the world’s oil-based economy ultimately inimical to our collective future on this planet? As the industrial powers race to extract the continent’s natural resources to feed their own consumption, they are fostering environmental degradation, corruption and human rights abuses. Africa Oil Week took place in Cape Town, late 2006. One of the conferences was even titled the Scramble for Africa. As is often the case with oil, military involvement follows closely behind trade, and in February this year the US set up an Africa command (Africom). It has established bases in and signed access agreements with Senegal, Mali, Ghana, Gabon and Namibia. 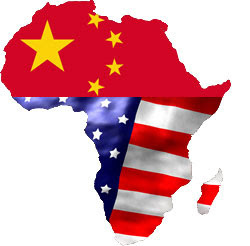 Africa is becoming strategically important to the US because of its oil production and China’s increasing influence in the region. The new entrant to the scramble is China. Despite its large land area, it is a resource-poor country and Africa offers the natural resources vital to fuel its rapidly growing economy. Beijing has charmed African rulers with a triple whammy of arms sales, cancelled debt and soft loans. Last year, president Hu Jintao and prime minister Wen Jiabao visited 10 African countries, and this increasingly intimate relationship was consummated at the China-Africa summit in October, when Beijing rolled out the red carpet to almost 50 African heads of state and ministers. Resource extraction has already caused severe environmental problems. And the competition for resources and profit fuels violent conflict and human rights abuses. The clearing of forests for timber exports increases vulnerability to erosion, river silting, landslides, flooding and loss of habitat for plant and animal species. Gas flaring from oil production, where unusable waste gas is burned off, pumps large amounts of carbon dioxide into the atmosphere. So what can Africa do about this? b real kindly pointed out this article, which suggests a possible response. As someone who watched the blunderings of the Cold War in Africa, and the brutal pointless devastation that created, I strongly endorse the author’s opinion, that African governments must develop a collective response. We all know there is strength in numbers, and we need all the strength we can muster for dealing with the twin Goliaths, the US and China. Almost all of the world’s major economic actors have a presence on the continent. Yet it is two of them — the US and China — whose footprints could leave the most-lasting legacy. And this legacy is unlikely to be positive. Ultimately, it would be prudent for advocates of African development to recognise that both countries are on the continent to advance their own national interest, and harbouring illusions to the contrary will result only in future disappointment. Moreover, such advocates should recognise that there is a great danger looming from this new scramble for Africa’s resources. The last time such a scramble took place, during the Cold War, the consequences were devastating. Both foreign powers, the US and Soviet Union, established client regimes, funded rebel armies, and engaged in proxy wars. The result was a continent wracked by civil wars, displacements of citizens, and cross-border refugee flows. How to avoid a repeat should be the overriding concern of Africa’s political elite. What then can be done? A collective African response can be the only solution . What form would it take? Some would argue for a pan-African solution in the form of a United States of Africa. But while such a development would be positive, it is not feasible in the short to medium term. What about the possibility of a continental charter of rights governing investments and engagements on the continent? Such a charter, which would have to be negotiated in the African Union (AU), could supersede bilateral agreements and force all external powers to accord to a specific set of practices. Of course, the administrative weaknesses and the capacity constraints of the AU may hinder compliance. But if such a charter were to be agreed to by the AU, it could be subsequently ratified in the United Nations, thereby strengthening its institutionalisation and enhancing the reach of its compliance. Is this likely? Probably not, given the divisions within the AU. But there is an urgent need to try to develop a continental African response. The failure to develop one would have serious consequences for Africa and undermine all of the significant achievements of the past decade. Given this, should this not be the principal focus of SA in the AU summit starting later this month ? Should we not use this opportunity to focus African minds in a realistic attempt to develop a collective African response to a developing continental threat? The new command’s main mission will be to stabilize weak or poor countries by training the local security forces and providing humanitarian aid. When I read it I see some things have been left out. These omissions are part of Bush/Cheney’s standard operating approach to the world, but they’ve been around since before Bush/Cheney. “The new command’s main mission will be to stabilize weak or poor countries,” or destabilize countries who may oppose or disagree with United States oil interests and intentions. And “training the local security forces” brings the notorious School of the Americas to mind, which has helped bring so much peace and security to Central and South America in the form of coups, torture, and destabilization. Libya and Morocco have both turned down hosting the Pentagon’s new Africa Command. Libya said it would oppose its neighbors hosting Africom HQ as well. A U.S. delegation got a chilly reception this month, meeting opposition even in countries that enjoy friendly relations with the Pentagon . . .
“We’ve got a big image problem down there,” a state department official admitted. “Public opinion is really against getting into bed with the US. They just don’t trust the US.” Another African worry was that any US facilities could become targets for terrorists, the official said. Economic incentives, including the prospect of hundreds of local jobs, had not proved persuasive. Bush/Cheney has done terrible damage to the US reputation. This may actually help African countries to stand up for themselves and make their own decisions. Solutions to African problems must come from Africa if there is any chance for them to work. I am impressed that all the countries mentioned said the US has to work through the AU. This may put additional pressure on West Africa, if the North African countries have said no. West African countries are not mentioned in the article. I worry about Kufuor being another poodle for Bush. There is already US military activity in Ghana. I hope this can be kept at a minimum. The US is now talking about a more distributed command, involving a number of countries. If this is the way things go, I hope Ghana can resist much in the way of active participation. A recent article by Kwadwo Nketsia in the Accra Mail raises the question of a US base in Ghana once again. I have not read that proposed in any US media recently. However, Bush/Cheney are unlikely to make anything public until they are forced to do so. The speculation I have read is that that a military base and Africa Command HQ may be located in Sao Tome and Principe, which would provide fast and easy access to the entire Gulf of Guinea, or possibly in Morroco. Still, Ghana would have much to offer the US Military, and I think it would be a mistake for Ghanaians to think a US Military base would have much that is positive to offer Ghana. Ghana is said to be among six countries being considered for the location of the military base. We are being considered due to our “true young democracy”, freedom of speech, good governance (which has earned us monetary rewards for MCA projects), and an excellent human rights record, (The Global Peace Index study has ranked Ghana the 40th most peaceful country in the world ) and other positive factors for better development. All these positives are true. Nketsia’s main argument for the base appears to be economic, paychecks would put money into the local economy, and the base would draw visitors from around the world. He thinks that a base will have a positive effect on health. He should look at the situation in the US, or ask the Philippines about the toxic waste and health care issues Clark AFB left behind. The U.S. military’s choice to ignore such toxic time bombs in the Philippines has already wreaked havoc on the Philippine people. Hazardous substances in the groundwater continue to migrate into heavily populated towns east of Clark . . . Not merely a sore spot in the relationship between the Philippines and the United States, this toxic disaster threatens people’s basic human right to a clean and healthy environment. 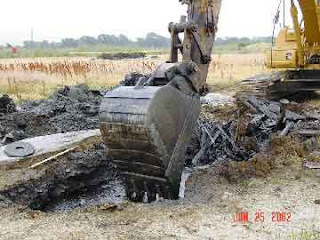 The contaminants emitted from military bases include pesticides, solvents, petroleum, lead, mercury, and uranium. The health effects for the surrounding communities are devastating: miscarriages, low birth weights, birth defects, kidney disease, and cancer. The U.S. Department of Defense is the largest polluter in the world, producing more hazardous waste than the five largest U.S. chemical companies combined. . . the burden of health impacts and environmental destruction falls disproportionately on poorer communities, people of color and indigenous communities. Women face particularly severe problems because of their sensitive reproductive tissues and children because their immune systems are not yet fully developed. This is what Ghana has to look forward to if there is a US Military base situated in Ghana. Under Bush/Cheney the current military strategy is the long war for oil. The object of the long war is to co-opt and contain oil supplies wherever they might be found around the globe. The recent discovery of oil in Ghana’s territorial waters may have increased US interest in Ghana as a potential US base. Nketsia also thinks the days of huge military bases are behind us. At present the US African bases are the lily pads he describes, and there is already some base activity in Ghana. But it you look at what the US is still building in Iraq, the new bases planned are even larger than ever. The US version of the colony is the military base. Countries that are home to these bases become occupied territories of the United States. 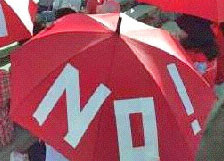 It is a fast way to lose sovereignty. In which Bush stands atop the Iraqi War dead, protecting life in a dish of stem cells.